You may download individual lessons or even entire units by visiting each curriculum page. View students in action and samples of student work. See the standards addressed with each unit and concept maps of each unit. Some of the units address specific ecosystems while others focus on key concepts. Check it out! Please note that all curricula currently available are drafts that will be updated periodically. Please feel free to send suggestions via email to prism@hawaii.edu. 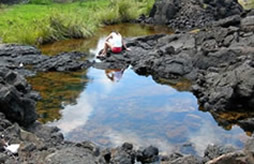 Anchialine ponds are one of Hawaiʻi’s most threatened ecosystems. 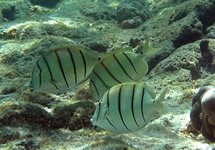 There are about 700 known anchialine ponds known in Hawaiʻi. 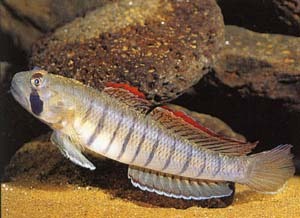 They exist in inland lava depressions near the shore and contain brackish (a mixture of freshwater and saltwater) water. This unit demonstrates the physical properties of saltwater and freshwater using the scientific method, observations of live opae ‘ula (a native shrimp) in the classroom, and a visit to an anchialine pond to survey the flora-fauna. Lessons stress both the biological and cultural importance of this ecosystem. The children's book titled The Adventure of Ebi the 'Opae 'ula, written by Bobby Hsu and Jackie Gaudioso, is an original work developed as part of the PRISM Program as a literature connection to the Anchialine Ponds science curriculum. The book is available in hard-copy for a nominal fee which includes printing and shipping costs only. If you are interested in obtaining a copy of this book please write to prism@hawaii.edu with your request. 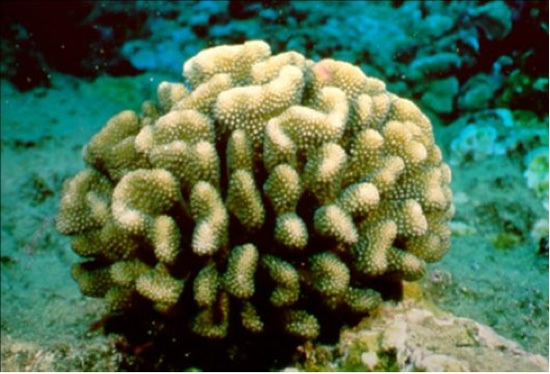 Corals consist of small, colonial, plankton-eating invertebrate animals called polyps, which are anemone-like. 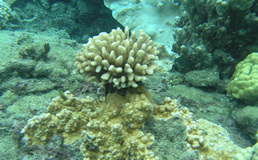 Although corals are mistaken for non-living material, they are live animals. Corals are living animals because they fit the five criteria of the definition of an animal (1. Multicellular; 2. Consumes other organisms for food; 3. Has an internal digestive system; and 4. Embryonic development; 5. Motile, or can move independently). 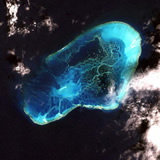 Corals feed on plankton, which includes tiny crustaceans, mollusks, and larvae of reef animals. Corals use their tentacles, or arms to sting and capture plankton that drift by on currents. Shallow-water corals grow the fastest and are called reef-building corals because they secrete skeletons of calcium carbonate, which construct large structures called coral reefs. Insects are everywhere and familiar to nearly everyone. Most children appear to have a natural curiosity about insects. This unit reinforces students’ curiosities by demonstrating the uniqueness of insects’ appearance and lifestyle. Lessons emphasize the diversity of insects and how they live – including what they eat, what eats them, and how they change (metamorphose) as they grew. By studying insects in detail through the inquiry process, students are encouraged to develop questions and solutions that promote insect conservation. In this unit, we introduce students to the rocky intertidal zones, as an important coastal resource for Hawai’i, both biologically and culturally. Through hands-on activities, live-specimen observations, and discussion sessions, students learn the physical properties, an overview of the flora-fauna, and the cultural uses of rocky intertidal zones. By studying this ecosystem in detail through the inquiry process, students will be encouraged to construct questions and solutions that promote conservation goals of the rocky shore. Ahupuaʻa refers to the traditional land division in Hawaiʻi. 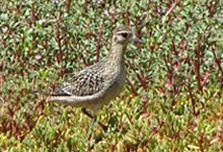 It provides a habitat for many native animals by supporting a diverse environment that includes the mountains, the valleys, and the sea. In this curriculum students will learn the basic natural history of some native animals in Hawaiʻi and how they are unique to their habitat. Through hands-on, inquiry-based activities, students comprehend the importance of preserving diversity of the native animals in Hawaiʻi. This unit teaches students about the sandy shoreline environment, which is well used by people as well as a variety of organisms including sea turtles, monk seals, birds, and a host of others. Key concepts include organism anatomy, adaptations, the creation of sand, and the ecology/biological makeup of the sandy shoreline. This unit explores plant biology from the perspective of the forest to the garden and our dining room tables. The unit balances cultural exploration of how native plants were used with laboratory lesson on what makes plants different from animals. Key concepts include plant life cycle, plant reproduction, native plant uses and how to grow your own garden. The Ocean Grazers units incorporates activities using wana and sea urchins, ʻopihi, pipipi snails, honu (green sea turtles), and herbivorous ʻia (fishes) to demonstrate the variety of marine grazers that feed on limu (seaweed). 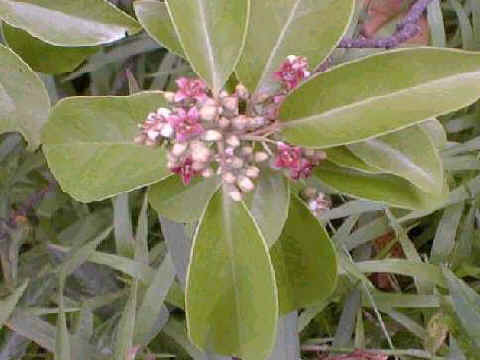 The main focus is on the connection between structure and function, and the relationship between plants and animals. 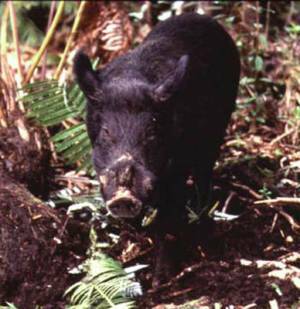 Invasive animals are those species that are introduced to native Hawaiʻi environments by humans. They negatively impact the native and endemic plants and animals by disrupting the trophic levels of communities. 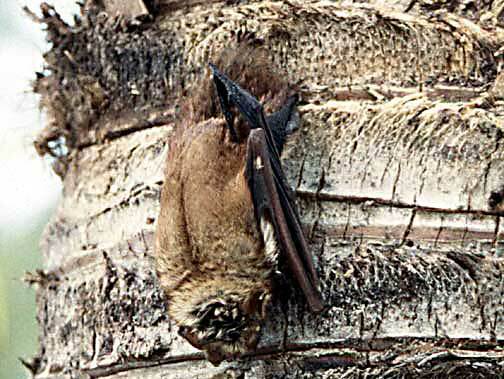 In doing so, invasive animals decimate the biodiversity of terrestrial environments. It is difficult to control invasive animals because of their defense mechanisms against island organisms and their rapid proliferation. 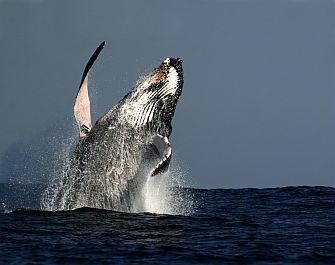 Humans are the root cause of invasive animal impact and they are able to develop means of control for the benefit of the island’s native species. This curriculum utilizes inquiry-based activities to introduce the need to maintain natural environments and cultivate social responsibility. Coral reefs in the Hawaiian archipelago comprise over 80% of U.S. coral reefs and span over 2,000km. Hawaiian reefs posses some of the most abundant levels of marine endemic species in the world as well as sheltering over 700 species of fish, 400 species of algae and over 2000 species of invertebrates. Reef-building corals are the keystone framework organisms in coral reefs and for this reason it is important for our youth to understand that corals are not colorful rocks but living organisms. This curriculum uses hands-on activities to promote interactive learning about Hawaii's coral as organisms and the coral reef ecosystem. This unit is designed to provide an enhanced understanding and appreciation for general fish anatomy and the physical adaptations they have developed over time to increase their ability to live and survive in the water. They will understand that while fish come in many shapes, sizes, and colors they all share the same basic anatomy with some specialized structures necessary for survival. Activities include a thought swap on what a fish needs to survive, dressing up as a fish, observing and comparing fresh fish, and more. Hawaiʻi’s forest ecosystems are very diverse; this can be attributed to the amount of rainfall that falls in an area and the elevation in which it is found. These ecosystems provide a habitat for a menagerie of plant and animal species, as well as, support the lifestyle and culture of island residents. This curriculum promotes an enhanced understanding within Hawaiʻi’s youth on how Hawaiʻi’s forest ecosystems function, the problems that they face, and how we can care for them. This unit includes hands-on, inquiry-based lessons and activities to promote and enhanced learning about Hawaiʻi’s forest ecosystems. Coqui frogs are an invasive species to Hawaiʻi that were first introduced in the late 1980's from their native home in Puerto Rico. Since that time their populations have drastically increased due to the ideal climate conditions provided by Hawaiʻi Island. This curriculum uses hands-on activities to promote student knowledge and awareness of the impacts caused by invasive species like the coqui frog in Hawaiʻi. The state of Hawaiʻi is actually around 41 percent ocean. The open ocean provides food, recreation, tourism dollars, and weather to Hawaiʻi’s residents. This unit helps students to classify the ocean’s different physical characteristics such as salinity as well as put together a biological picture of the types of animals living in the open ocean. The unit also stresses human use of the ocean, how we study that use, and what science is telling us. In this curriculum students dive deep into ocean exploration as they create their own Hawai’i ocean maps, learn how to use navigational tools such as GPS, experience a day in the life of an open-ocean researcher, apply mathematics to calculate the growth and diet of ocean animals, discover the unique characteristics of marine mammals, collect and analyze water samples using water chemistry techniques, research the uses of native limu (seaweed), and learn to communicate the importance of fishing regulations and ocean conservation. The Hawaiian Dry Forest is one of the most endangered ecosystems in the world. This unit uses the dry forest as a way to explore invasive species and the importance of conservation. The unit culminates in a community education project in which the students create educational brochures to handout to the public. Growing up surrounded by ocean, Hawaiian students are often well exposed to marine animals and issues. However, the fresh and brackish waters of Hawaiʻi are full of wonderfully adapted native animals as well as noxious invasive animals. These animals and ecosystems, which are found in every student’s backyard and require neither a boat nor a fishing pole to investigate, are an excellent topic to make science relevant and interesting. This curriculum uses inquiry-based lessons to teach important scientific issues, such as experimental design, relatedness between species, and adaptations, within the context of Hawaiʻi’s fresh and brackish water ecosystems. In their classroom, students will use observations of endemic Koa Bugs (Coleotichus blackburniae), Hawaiʻi’s largest endemic true bug, to learn about insect life cycles, interactions and dependence of organism on one another. 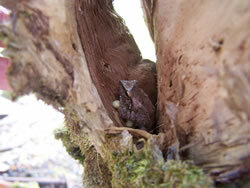 They will also study how an organism’s structure contributes to their ability to survive and reproduce. Since Hawaiʻi is the most isolated archipelago on the planet, plants and animals have had to adapt to fit the needs of their environment. This unit uses examples of Hawaiʻi’s unique flora and fauna, such as the Hawaiian honeycreeper and the happy-face spider, to explain evolutionary concepts including genetic variation, adaptation, and natural selection. 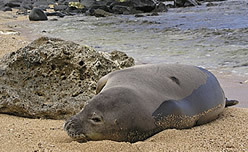 The Northwest Hawaiian Islands are now a National Monument and the United State's largest marine protected area. This curriculum is focused on the Northwestern Hawaiian Islands, Currents, and Marine Debris/Sea Bird Interactions. Students completed a final project by dissecting Albatross Boluses and making the connection between all of the subject areas. While much of the material contained within this curricula is original, a great part of many of the lessons build upon already constructed lesson plans and/or materials. Source materials are credited within each curriculum. Mahalo to everyone that has in some way contributed to this work.